Jon Shaw in possession for Shields. Picture by Peter Talbot. 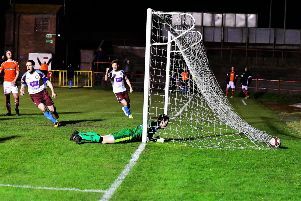 South Shields hope to finally return to action tonight when they travel to Cleethorpes Town in the League Cup. The Mariners have not played since February 24 after suffering a host of postponements. The third round tie against Cleethorpes has been called off twice, but Shields are eager to get back on the pitch this evening. It will be a rematch of last season’s FA Vase final, which Shields won 4-0 at Wembley. Defender Jon Shaw says the Mariners – who will field a mixture of youth and experience tonight – are determined to make their mark in the competition. He said: “We were very upset with the way we went out of the FA Cup, because we felt we deserved to stay in it. “We were poor against Stafford Rangers in the FA Trophy, and we went out of the Durham Challenge Cup in disappointing circumstances against Hartlepool United. Shields also face an Evo-Stik League North trip to Glossop North End on Saturday.